That depends on what you mean by car. If, like Wikipedia, you define a car simply as “a wheeled motor vehicle used for transporting passengers, which also carries its own engine or motor,” then the first car was invented in 1769 when Nicolas-Joseph Cugnot built his steam-powered tricycle. Developed to haul artillery for the French army, this three-wheeled baby reached a top speed of 2 mph. Cugnot’s tricycle was plagued with water supply and steam pressure issues, however, so the army ultimately rejected it. But before you jeer at Cugnot, keep in mind that early internal combustion engines weren’t much better. Nicéphore Niépce and his brother Claude created what is probably the world’s first internal combustion engine when they invented the Pyréolophore in 1807. Their engine was fueled by a mixture of dried moss, finely crushed coal dust, and resin, but as their engine was installed on a boat, the resulting transport vehicle probably doesn’t exactly count as a car. Steam and internal combustion weren’t the only ideas early car makers tinkered with. The first electric vehicles capable of carrying passengers began popping up in the 1830s. During that decade, Robert Anderson of Scotland, Professor Stratingh and his assistant Christopher Becker of Holland, and Thomas Davenport from Vermont all built electric cars of one sort or another. Their practical applications were limited by their batteries, not too surprisingly. 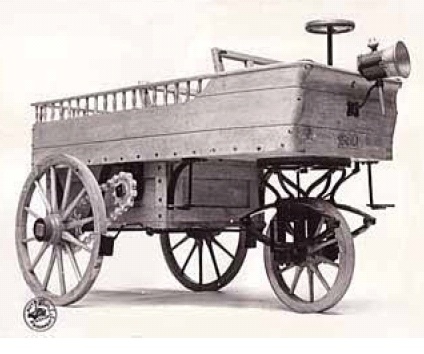 Electric car inventors continued to wrangle with the problem of developing higher capacity storage batteries until 1891, when American inventor William Morrison introduced the first practical electric vehicle–a 6-passenger wagon. His invention sparked so much interest in electric vehicles that New York City introduced a fleet of electric taxis in 1897. So Who Invented the Car As We Know It? All that aside, most credit Karl Benz with inventing the modern automobile. At least, his 1886 Patent-Motorwagen is the first vehicle that at least somewhat resembles the modern car. The Motorwagen began to look even more like a modern car in 1893, when Benz added a fourth wheel to the design. Of course, we recognize Benz’s Motorwagen as the first modern car now, based on the knowledge that his internal combustion engine design would ultimately win out. At the time, however, that couldn’t have been at all clear. Electric and steam-powered cars were both more popular in the early days. 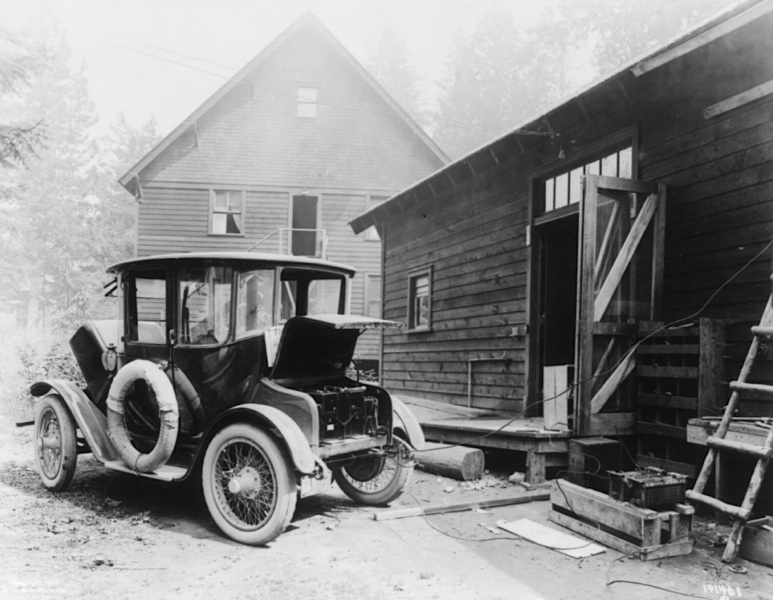 A 1919 Detroit Electric car being recharged. In fact, in 1899 and 1900 more electric cars were sold in America than any other type. Electric cars were quieter, more comfortable, and less smelly than those powered by gasoline. And, unlike their gasoline-powered contemporaries, electric cars didn’t require drivers to shift gears while driving. Although the range on electric cars was limited–the 1902 Woods Electric Phaeton had a range of only 18 miles–in general electric cars could go further on a single charge than cars based on steam. Starting an electric car up was relatively effortless as well–in contrast to gasoline cars, which had to be cranked by hand, and steam-powered cars, which could take 45 minutes to warm up on cold mornings. 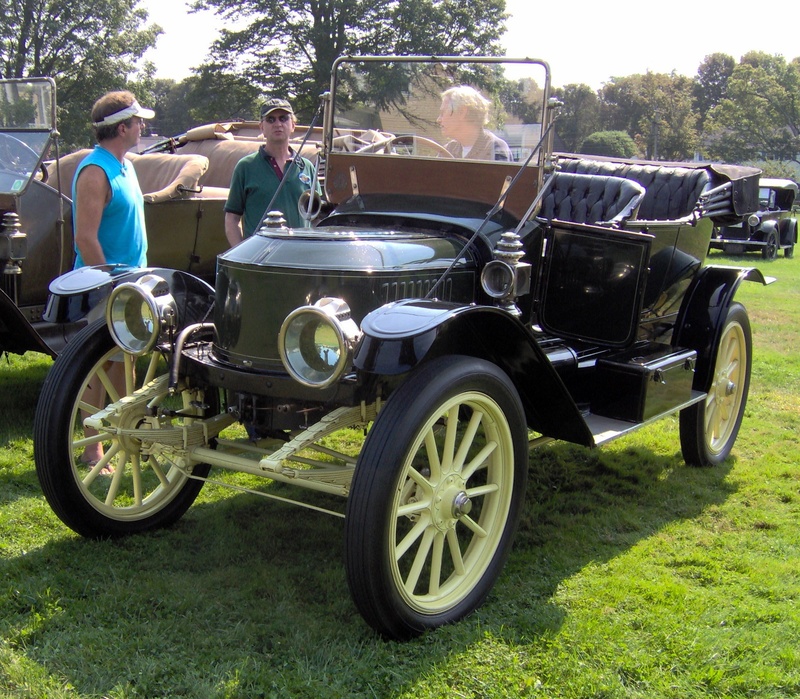 Still, electric cars had some powerful competition in steam-powered cars like the Stanley Steemer, which was introduced in 1896. Like electric cars, steam-powered cars didn’t require drivers to shift gears, which made driving them (once they had warmed up, that is), a bit easier. Steam designs also benefited from years of experience with using steam to power trains. You could (theoretically) burn just about anything to generate the steam used to run them. In fact, early Stanley Steemers burned gas, but later models used a cheaper combination of fuels–only burning gas for the pilot light and using less expensive kerosene in the main burner. And steam-powered cars were faster. Steam cars held most of the land speed records until 1920, when the internal combustion engine finally caught up. And we’re not talking the hippo-speeds of the early steam vehicles, either. In 1906, Fred Marriott set a new Land Speed Record when he drove his Stanley Steemer an astonishing 127 mph (204 km/h) at Ormond Beach, Florida. Steam and electric cars were quieter, cleaner, faster, and had more convenient fueling options than cars run on gas. The Woods Motor Company even offered a hybrid model in 1916 that combined an internal combustion engine with an electric motor. So why did the internal combustion engine win out? That’s a great question — for tomorrow. As ever, so fascinating as well as constructive post �When were cars invented? � | CATERPICKLES… Thanks a lot! I’d really love to be a part of online community where I can get suggestions from other knowledgeable people that share the same interest. If you have any suggestions, please let me know. Thanks! If you’re interested in vintage cars, you might start with TheOldMotor.com. They have lots of great information on their blog, and could probably hook you up with like-minded folks.